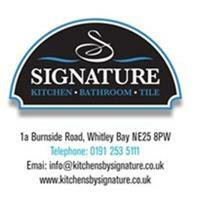 Signature Kitchens, Bathrooms & Tiles Ltd - Bathrooms, Kitchens based in Whitley Bay, Tyne and Wear. Signature Kitchens, Bathrooms and Tiles is a family run business ran by husband and wife team Tony and Vicky. As the business is family run we really get to know are customers and give then help and advice every step of the way. We offer free planning and design service with all our kitchen and bathrooms. We can also offer to fully project manage your home improvements taking all the stress away. As well as planning and design we offer installation, we can provide appliances and accessories. Visit our showroom and see all the ranges we have on offer. With many years experience in the business we can plan every stage of your project from beginning to end.